In previous versions of AcctVantage, if a Receipt was entered on the Payments tab of a Sales Order, the Order and the linked Receipt would post to the General Ledger together. This would happen at the time the Order is posted. As of AcctVantage ERP Server v2013.0.0.5, you now have the ability to enter a Receipt on the Payments tab of a Sales Order and then post the Receipt independently of the Order. This is helpful if you don't want to post the Order to your GL just yet (thereby increasing Sales Revenue & COGS and decreasing Inventory)...but you do want to post the Receipt so you can reconcile your bank statement. 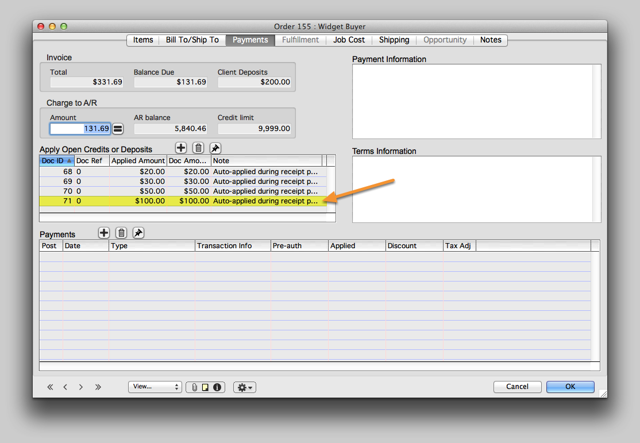 You must have a Sales Order with a Receipt that has been entered on the Payments tab. The Sales Order must not be posted. You must have a Client Deposits liability account entered on the Client record. You can have as many of these linked Receipts per Order as you need. This is a new revision to this feature as of v2013.1.0.0. If you have a Receipt [that was entered] on the Payments tab and posted [so now it's a Deposit] and your customer wants to cancel the original Order and apply the deposit to a different Order, you can do this too! When issuing a Credit Memo, you can also apply that credit balance to a previously entered Order. On the Payments tab of the Sales Order, we have a Ready-To-Post Receipt. We want to post this Receipt prior to posting the Sales Order. This will let us reconcile our bank statement without posting the Sales Revenue (which is what would have occurred prior to v2013.0.0.5). Note that the Client previously had paid progress payments totaling $100. Open the Action Menu and select Post Selected Records. 2.1. Are you sure you want to post? 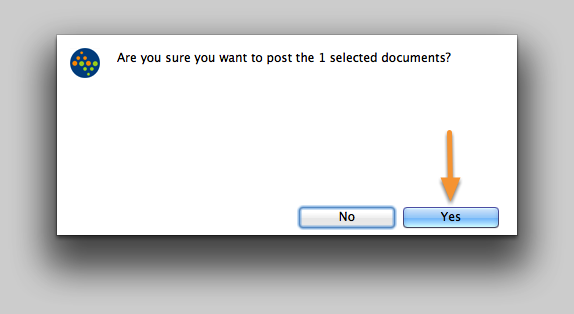 Select Yes to proceed with posting. 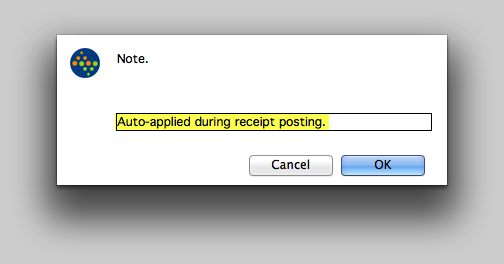 When the Receipt is posted, it will be unlinked from the Order and will be converted into a Client Deposit. 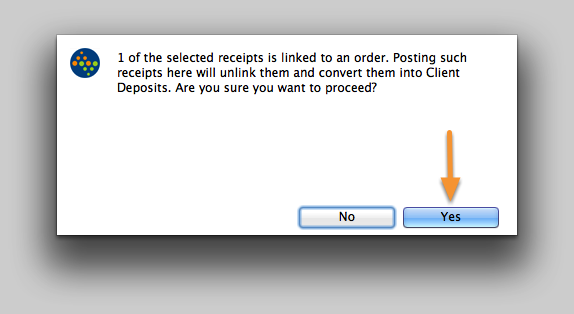 Click Yes to proceed. The Receipt will be posted as if it were a Client Deposit and the Deposit will be automatically applied to the Sales Order from which the Receipt was originally linked. 3. The Sales Order now has a Deposit (instead of a Receipt). Notice there is no longer anything in the Payments section. After the Receipt is posted, it is converted into a Client Deposit and applied to the Order in the section labeled Apply Open Credits or Deposits. The Receipt (i.e. 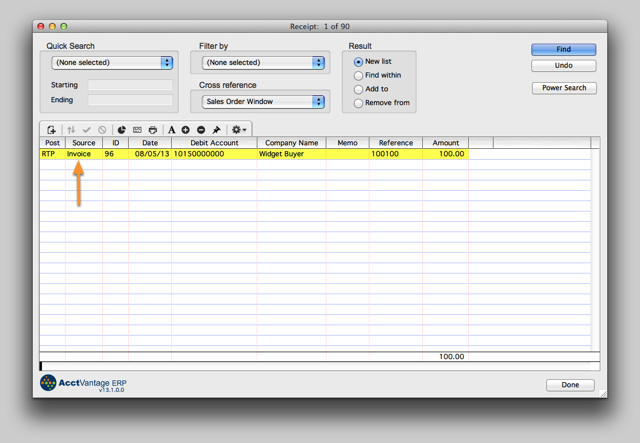 Deposit) can now be batched into a Bank Deposit and reconciled when you receive your Bank Statement. Zoom: The Sales Order now has a Deposit (instead of a Receipt). Modify the Note on the new line item. If you double-click on the new line item in the Apply Open Credits or Deposits section, you can modify the line item Note. Click OK to save.